I’ll say this for Santangelo’s. They were as ready for my dear wife Karen and I’s anniversary dinner as we were. And my better half had done things up right during her break from class on a Friday, going to the folks who do nails as part of their learning plan to have a pair of customized fingertips to flash for our big celebration. Yes, we were married nine years ago. This was our first trip together to the pretty family place since moving to A Bitty Better in the Liverpool neighborhood of Galeville. It sits just a mile or so down the hill and toward the library. No, we decided not to walk. Too much traffic on a Friday evening on Old Liverpool Road, and all. Indeed the hostess was ready with our table for two as soon as we entered. We were sort of set on what we wanted, too, because I’d called up their site for a look-see at their menu. The two Italian platters caught my eye, because I go for those type of samplers. And then I saw the Italian Feast for Two. 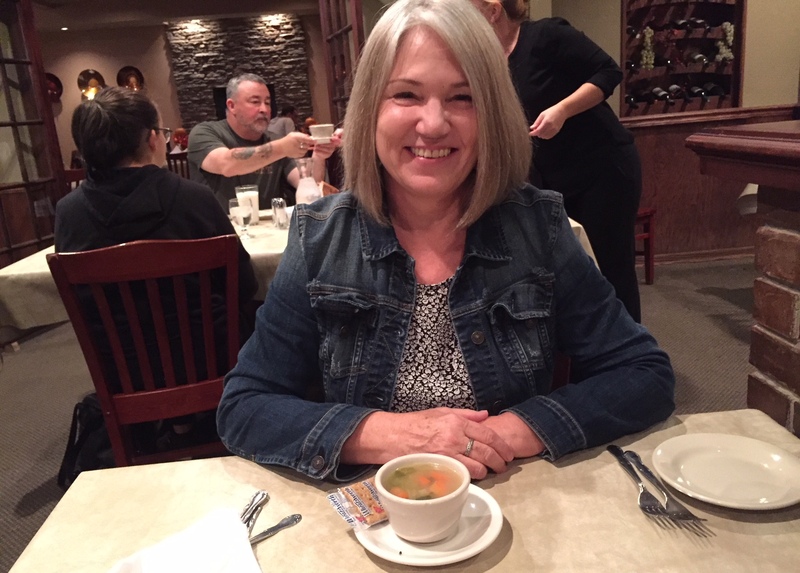 It would allow us to enjoy the soup, the appetizer assortment, entrees that included almost everything on both platters and other dishes we both loved, and cake and coffee. 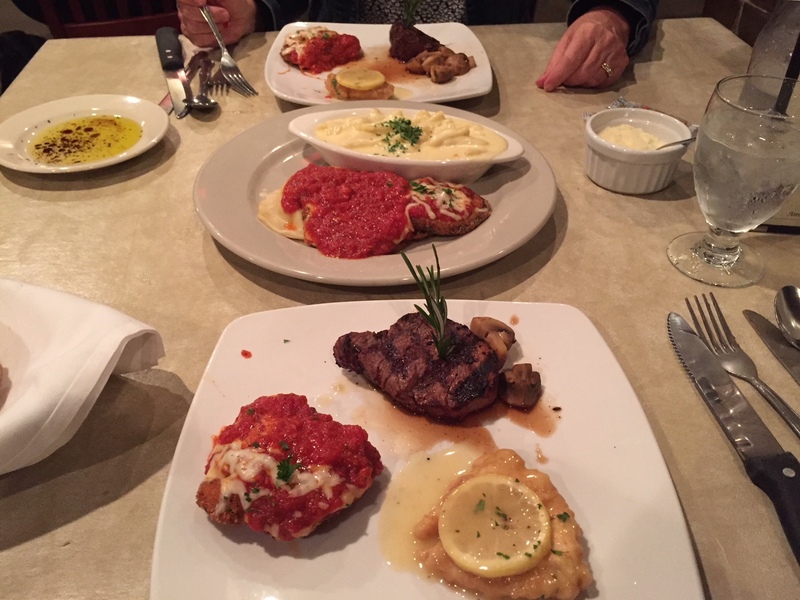 Did we have to choose from the chicken francaise, eggplant Parmesan, cavetelli Alfredo, chicken parm, ravioli and filet mignon, we wondered? No, the waitress told us. You get it all. 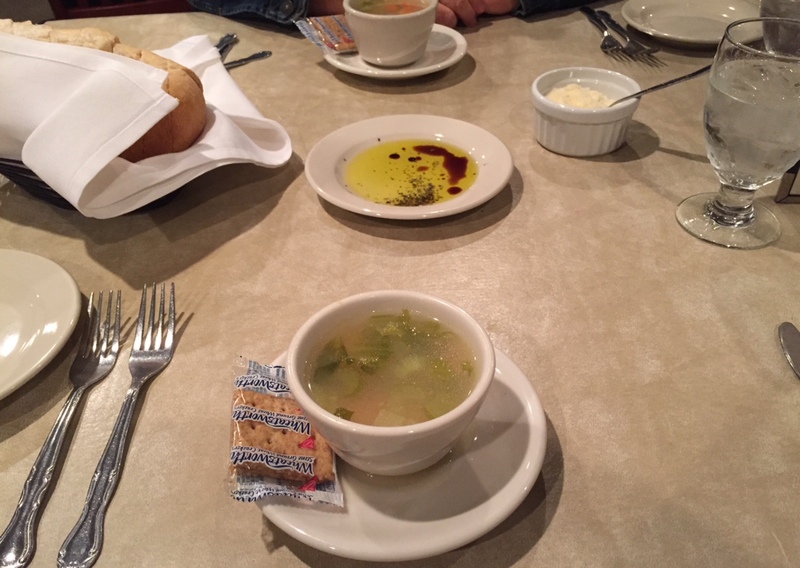 Bread, dipping olive oil, the soup. The full-scale celebration began with bread with a tasty olive oil dipping concoction. Then came the chicken soup. My dear wife decided we were off to a great start. We took our time, savoring it all. Our waitress allowed us to eat at our own pace, and was always ready with the next course. A meal in its own right. Next came the appetizer assortment. My favorite were the pair of friend mozzarella triangles. I even dipped one in the cocktail sauce, which I liked as much as the marinara sauce. I ate the inside of a stuffed mushroom, too. 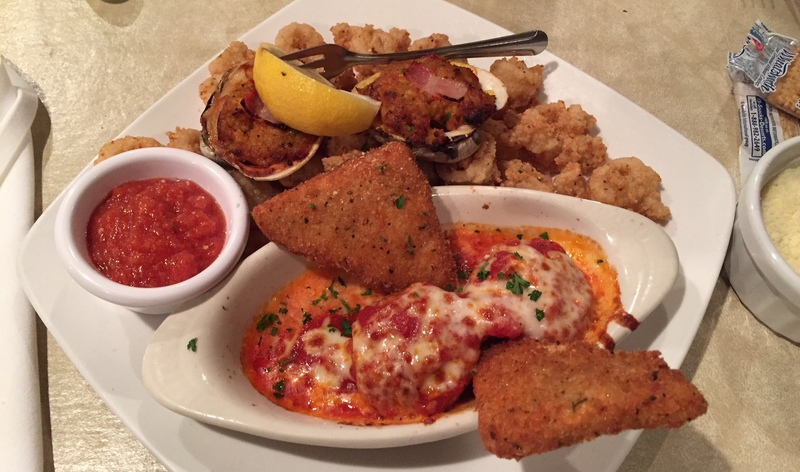 Karen appreciated the whole stuffed mushroom, fried calamari and clams casino. Antipasto for two could feed a whole family. 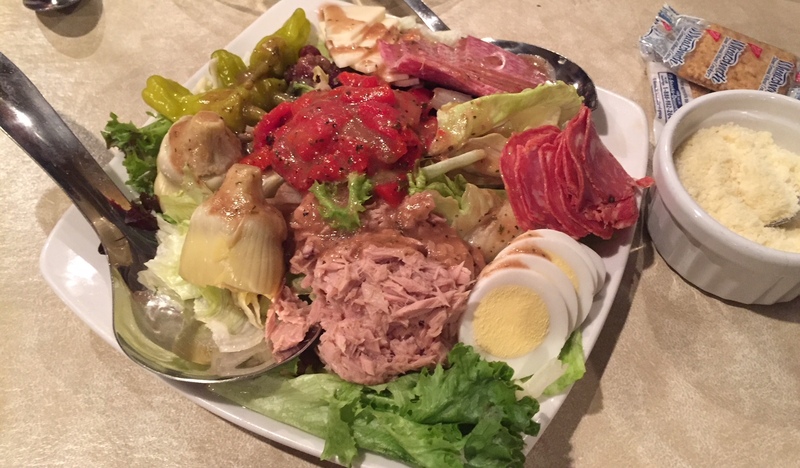 The antipasto salad course was stuffed with greens, other colored veggies, tasty meats, a sliced egg, fresh cheese and a big clump of tuna fish. It would have been enough for four diners to taste, easily. At this point, the couple at the next table leaned in and told us they envied our decision to go with the Italian Feast. They smiled when I informed them of the reason why we splurged, and wished us a Happy Anniversary. Next time, they said, the feast was for them. They smiled more at our main round. The waitress individually served our portions of filet, chicken parm and chicken francaise. The other three dishes were piled quite high family-style in the center. By this time, we were pretty full. I took a taste of the eggplant, ravioli and Alfredo, yes. The chicken parm was the only item on my main plate that I completely finished. A lot went home with us, in two separate containers. It was a feast. It was a Happy Anniversary. Thank you, kind folks at Santangelo’s. Thanks, Beth. It was fulfilling all the way around. Good thing you chose not to walk to the restaurant, because after eating all that scrumptious food, I am sure the walk back would have challenging. Happy Anniversary!!!! Thank you, Mark, for this feast of a post. Happy anniversary to you and Karen! Thank you, Ann, for all of your kindness always in huge supply. Wow. That was a feast, for sure. The bread and seasoned oil…yum. And then, the antipasto plate. I might have had enough to stop right there. Happy Anniversary to you both. Enjoy the leftovers. That all looks delish. Happy Anniversary to you both! Thanks, Tony. We loved our special dinner. Oh my goodness, what an amazing line-up of food! You are set for your next couple of meals, lol. Happy Anniversary! Thanks, Kathryn Grace. We were full, full, full, for sure! Oh that is a fantastic looking dinner MBM! Happy anniversary to you and DWK! And many many many more! Thanks so much, MBC. We appreciate the wishes. 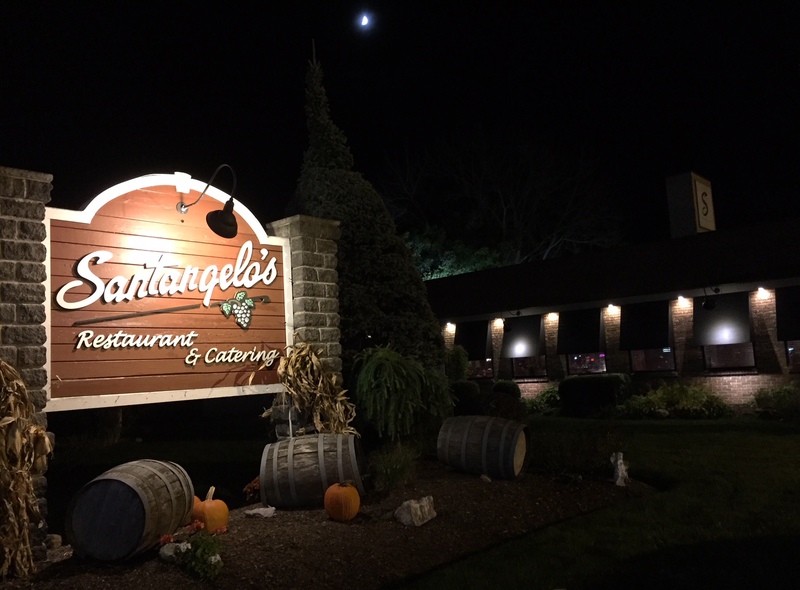 What a good choice Santangelo’s was for your celebration, Mark! I haven’t eaten there in awhile but I do recall their excellent Utica Greens. 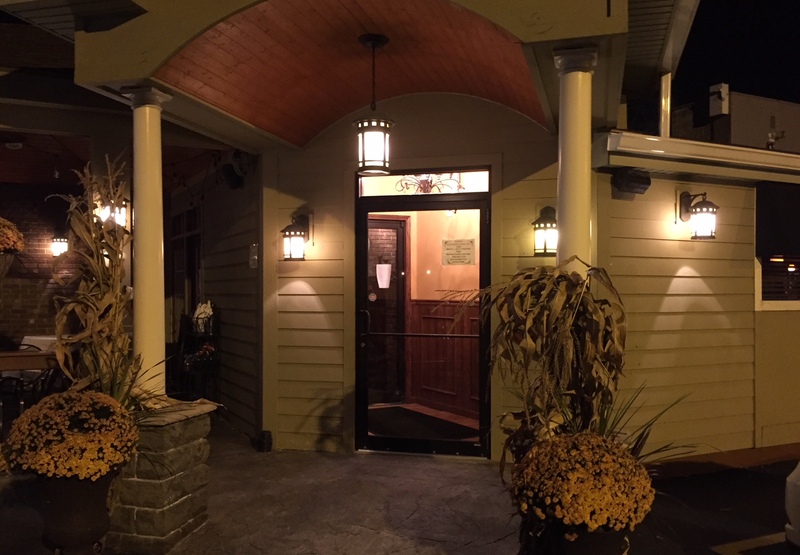 Your story and pix on it are terrific, and I will be dining there soon! Many more years of happiness to you and Karen! Thank you, Ermine! Another trip, I will certainly order their Utica Greens. I am due a serving of that savory dish! I hope you are well, my friend. Happy Anniversary my friend!! Great choice for a special dinner!! Thanks, Nancy. We had a wonderful celebration.